Chapter 13 verse 7 is another powerful verse about Jesus: ""Awake, O sword, against my shepherd, the man who is my partner, says the LORD Almighty. Strike down the shepherd, and the sheep will be scattered, and I will turn against the lambs." This last sentence is quoted by Jesus just before his arrest in Matthew 26:31 and Mark 14:27. It is applied to the scattering of the apostles, but can also be considered for the dispersion of the Jews in A.D. 70 after the destruction of the temple in Jerusalem. 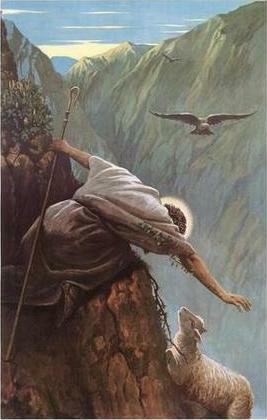 And yet, even after the sheep were scattered, do you realize that Jesus is seeking after his lost sheep? Have you been found by Jesus? Bible.org's commentary on today's readings in Zechariah titled "Oracle Concerning Israel" is at this link. New Testament - Revelation chapter 19 verses 7 through 9 discuss the wedding feast of the Lamb (Jesus) in powerful language: "Let us be glad and rejoice and honor him. 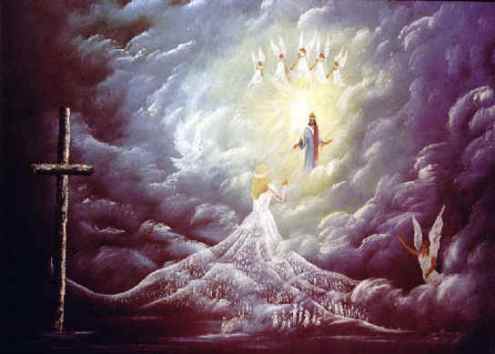 For the time has come for the wedding feast of the Lamb, and his bride has prepared herself. She is permitted to wear the finest white linen." (Fine linen represents the good deeds done by the people of God.) And the angel said, "Write this: Blessed are those who are invited to the wedding feast of the Lamb." And he added, "These are true words that come from God." The wedding feast of the Lamb is the end of human history - the judgment of the wicked and the wedding of the Lamb and his bride, the church. Are you looking forward to the wedding feast of the lamb? Do you want to be there? Do you believe the words - blessed are those who are invited to the feast? Have you accepted the Invitation? Revelation chapter 19 utilizes the Hebrew for Hallelujah! four times in the first six verses - but it is interesting to note that Hallelujah is not used anywhere else in the New Testament. 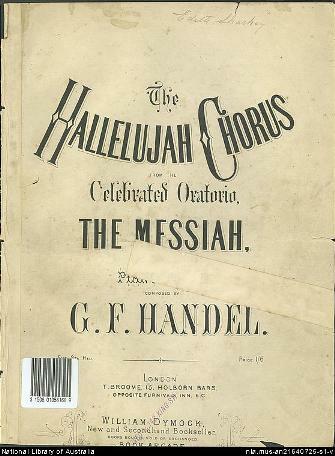 Though, certainly we are reading Hallelujah frequently now in the Psalms! (such as today's Psalm 147). The Hallelujah's in this chapter, along with verse 16 in today's readings - "On his robe and thigh was written this title: King of kings and Lord of lords." - reminded me of Handel's Messiah. The rider on the white horse in chapter 19 is not the rider of the white horse from earlier in the book of Revelation, chapter 6 verse 2. The rider in this chapter is Jesus, returning as Warrior-Messiah-King. It's interesting to note that many of the Jewish faith in the 1st century were looking for their Messiah to come as Warrior-Messiah-King, and thus they rejected Jesus as Messiah, who came then as the Suffering Servant. However, it is powerful for us to keep in mind that Jesus is indeed coming again - and when he returns it won't be in his previous role as the Suffering Servant. That debt has been paid. Jesus will return as Warrior-Messiah-King! 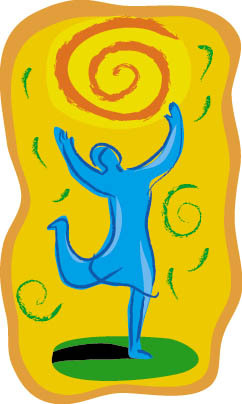 Below is an image for verse 21 in today's readings that is well worth cheering about! "And the beast was captured, and with him the false prophet who did mighty miracles on behalf of the beast—miracles that deceived all who had accepted the mark of the beast and who worshiped his statue. 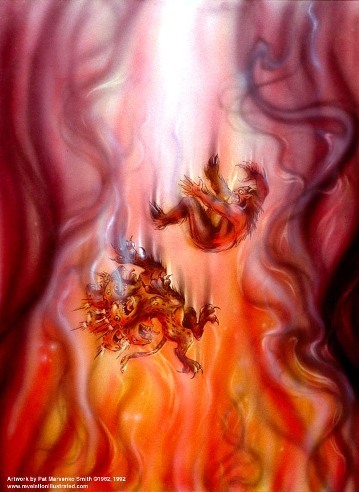 Both the beast and his false prophet were thrown alive into the fiery lake of burning sulfur." Bible.org's commentary on today's readings in Revelation chapter 19 titled "The Second Coming of Christ" is at this link and "Eater or Eaten?" is at this link. Psalms - Psalm 147 was thought to have been written for Levitical singers on the happy occasion of the dedication of the rebuilt walls of Jerusalem - see Nehemiah 12:27-43. 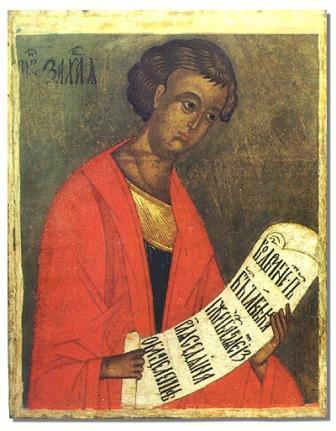 Psalm 147 was divided into two Psalms - verses 1 through 11 and 12 through 20 - in the Septuagint, the pre-Christian Greek translation of the Old Testament. However, the Hebrew text has the Psalm as one whole Psalm. Verses 10 and 11 are an incredible middle point of this Psalm that stood out to me today: "The strength of a horse does not impress him; how puny in his sight is the strength of a man. Rather, the LORD's delight is in those who honor him, those who put their hope in his unfailing love." These verses remind me that God really is not impressed with our shows of "strength" or "independence." God is much more impressed when we are dependent on Him. Are you honoring the Lord with your life today? Do you put his hope in his unfailing love? Or do you rely on your own strength? Today in Psalm 147 I liked verse 15 a lot: "how swiftly his word flies!" Indeed, it is true! 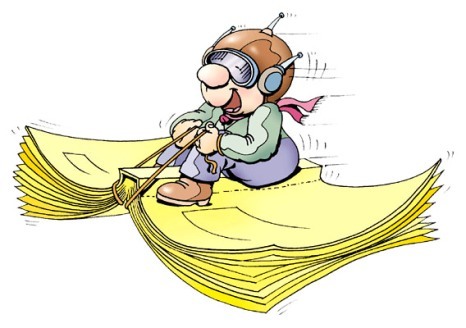 I pray God's Word, the Bible, is flying swiftly (and powerfully!) in your life this year! Proverbs - Proverbs chapter 31 and the preceding chapter 30 are thought to be essentially an "appendix" to the overall book of Proverbs, as they are non-Israelite in origin. Chapter 29 was the final chapter of the Proverbs of Solomon. Proverbs chapter 31 verses 1 through 9 consist of 3 sayings that King Lemuel's mother taught him. The entirety of Proverbs chapter 31 demonstrates the significance and role of wise women in the ancient Near East, where the queen mother was often an influential figure. Who have been some wise women in your life? Have you been invited to the wedding supper of the Lamb? Click here for your invitation! Prayer Point: Pray that you are invited to the wedding supper of the Lamb through a saving faith in Jesus Christ as your Lord and Savior. First, I thank you Mike...your insights have blessed me this year. I look forward to next year with hope and anticipation of what my Lord will teach me. I share in as few words as possible my first hand expereince with the feast of the bridegroom. As my grandfather was dying he was so excited because he kept telling my grandmother that the bridgroom was coming and he could see the table with the feast lying on the table. The nurse in the room kept saying I am sorry that he is not comprehending anything as he draws closer to death. With glee in my grandmother's heart she kept telling the nurse that my grandfather WAS comprehending and that Jesus was on his way to take my grandfather to the feast. My grandfather died with his last words being He is coming, the Bridegroom is coming and the feast is prepared!! A few days later my grandmother led the nurse to the Lord! ...God is good and yes, He is coming!!! All Scriptures below are in the Amplified Bible version. 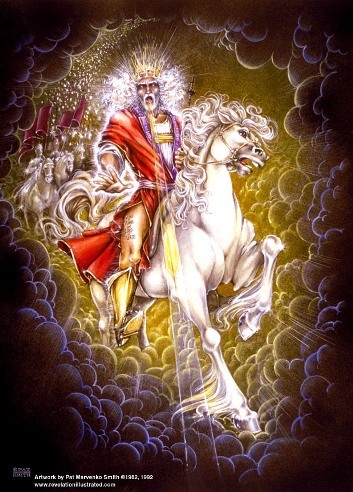 11 And I saw heaven opened, and behold, a white horse, and He who was riding it is called Faithful and True (trustworthy, loyal, incorruptible, steady), and in righteousness He judges and wages war [on the rebellious nations]. When Jesus comes again, He returns as Judge and Warrior! Nothing that needs to be judged and purged will escape His "FAITHFUL" eyes! 13 He is dressed in a robe dipped in blood, and His name is called The Word of God. And of the peoples there was no one with Me. And I stained all My clothes. The Word of God - Written in the Targum, and in other Jewish writings, דיי מימרא meimera daiya, "the word of Jehovah;" by which they always mean a person, and not a word spoken. 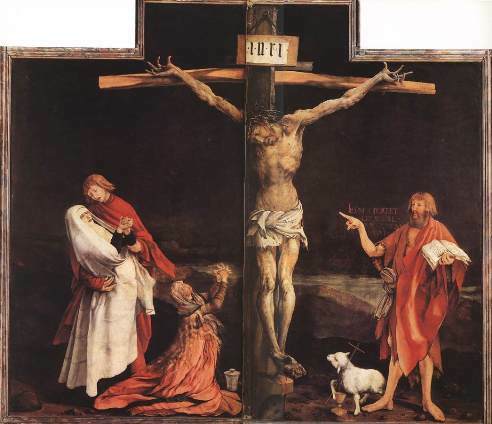 14 And the Word (Christ) became flesh, and lived among us; and we [actually] saw His glory, glory as belongs to the [One and] only begotten Son of the Father, [the Son who is truly unique, the only One of His kind, who is] full of grace and truth (absolutely free of deception). Amen, this is the Lord and Savior Whom we believe in and try to follow. May He in His mercy continue to lead, guide, and deliver each believer as 2016 ends and as we move onto 2017. May His saving grace, His healing mercy and salvation be with your brother, Alan.